Less than two weeks after he announced his retirement from MMA, UFC superstar Conor McGregor is already teasing his return to the octagon. Earlier this week, Khabib had compared McGregor to "a jealous wife" while speaking to students of Moscow's Plekhanov Russian University of Economics. "He could not reach an agreement with the UFC and now wants to play this card. Conor acts like a jealous wife, who says 'I will leave' all the time, but then comes back." McGregor issued his response Tuesday night on twitter. 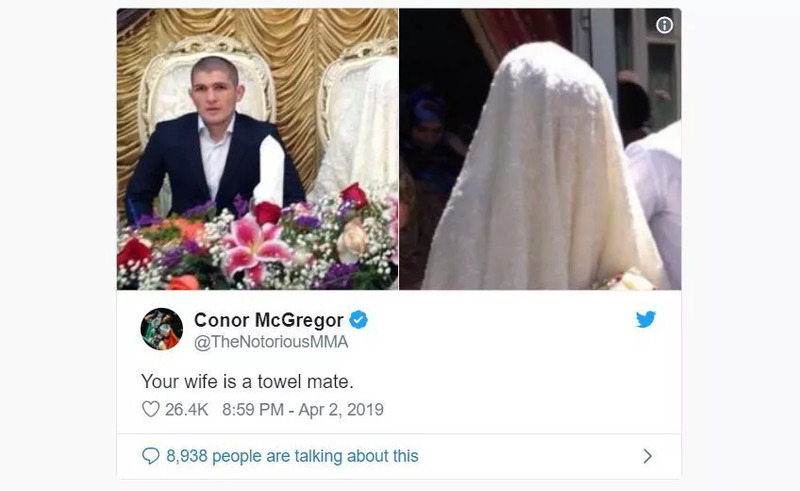 This since deleted post, featuring a photo of Khabib and his wife on their wedding day, simply reads, "Your wife is a towel mate." The 30-year old Irishman tapped out to Khabib in the fourth round of UFC 229, and we all know the chaotic melee that ensued afterward. "@TheNotoriousMMA money comes and goes, the honor that you lost that evening will never return, live with it. Finish career in mma, but start career on twitter? #twitterWarrior"
Both men are still serving suspensions for their roles in the post-fight brawl.